Adding her stimulating and finely framed ethnography to recent work in the anthropology of the senses, Kathryn Geurts investigates the cultural meaning system and resulting sensorium of Anlo-Ewe-speaking people in southeastern Ghana. 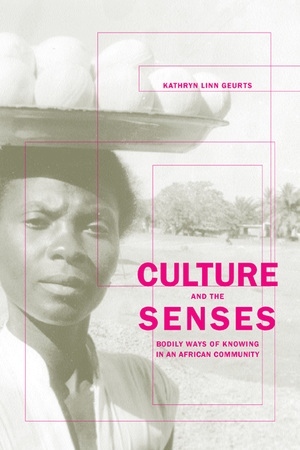 Geurts discovered that the five-senses model has little relevance in Anlo culture, where balance is a sense, and balancing (in a physical and psychological sense as well as in literal and metaphorical ways) is an essential component of what it means to be human. Much of perception falls into an Anlo category of seselelame (literally feel-feel-at-flesh-inside), in which what might be considered sensory input, including the Western sixth-sense notion of "intuition," comes from bodily feeling and the interior milieu. The kind of mind-body dichotomy that pervades Western European-Anglo American cultural traditions and philosophical thought is absent. Geurts relates how Anlo society privileges and elaborates what we would call kinesthesia, which most Americans would not even identify as a sense. After this nuanced exploration of an Anlo-Ewe theory of inner states and their way of delineating external experience, readers will never again take for granted the "naturalness" of sight, touch, taste, hearing, and smell. Kathryn Linn Geurts is Assistant Professor of Anthropology at Hamline University. 1. Is There a Sixth Sense?